Our hotel is ideally located just outside of Afandou village, one of the most beautiful and traditional resorts of the island.In a short distance from Faliraki and Kolympia and just a few kilometers away from Lindos and Rhodes Town. The position of Rodos Blue Resort is the perfect place to discover the island of Rhodes. Opposite the hotel Rodos Blue Resort located Afandou golf course. It is a golf course with 18 holes (73 par - 6800 yards), designed by world- renowned golf course architect in Britain, Donald Harradine. 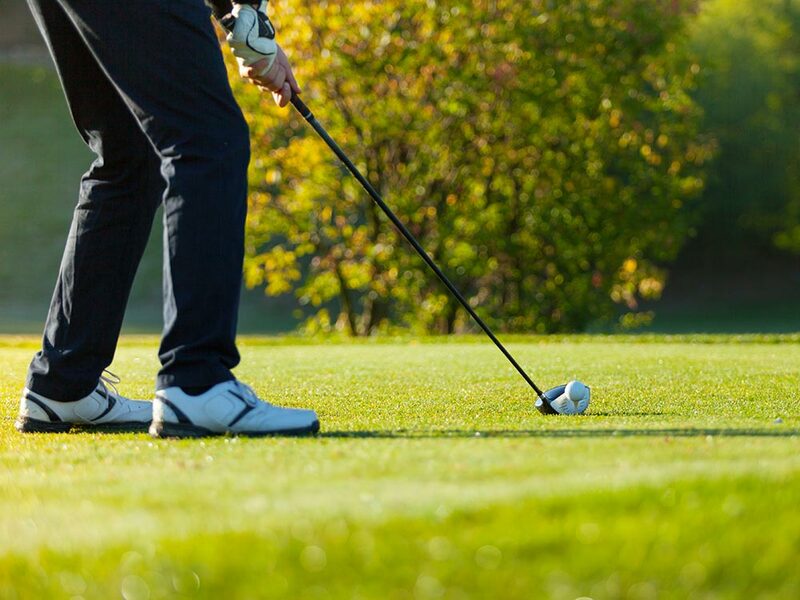 The golf course has the features which is challenge both for amateurs and for professionals, to achieve a good score. The golf club is open all year. 18 km away from the hotel. Is located the old town of Rhodes and of course the Centre of the town, where you can do your shopping. In the old town stands the palace of Grand Master, the ‘’Castello’’, one of the first buildings constructed by the knights, and imposed a walk on the famous Knight’s street which has been restored like it was in medieval times. Along the street, where the houses of those who made up the order of the knights of St. John. 5km from the hotel is the famous Faliraki, which is the one of the Mediterranean destinations, where the European youngsters want to visit in order to have fun and party day and night!!! Faliraki has one of the largest (5km) and best organized beaches in Greece with extreme water sports like bungee jumping, and a famous waterpark, which is the biggest in Europe. The waterpark will offer to all its visitors (especially the young ones) spectacular routes on the water slides, unique swimming pools and many ‘’splash’’!!! Just 5 km from the hotel is kolympia village. Kolympia village was built by the Italians as a model agricultural village and because of that they don’t belong to the traditional villages of Rhodes. The coast consists of two bays with beautiful beaches. It’s about a quiet place with friendly residents and it’s mostly a tourist place with luxury hotels. 30km from the hotel, you will meet Lindos. A vertical rock step and inaccessible, with obvious signs of the past on its top, with the vast sea to surrounds it and a settlement fully fitted between these two elements. 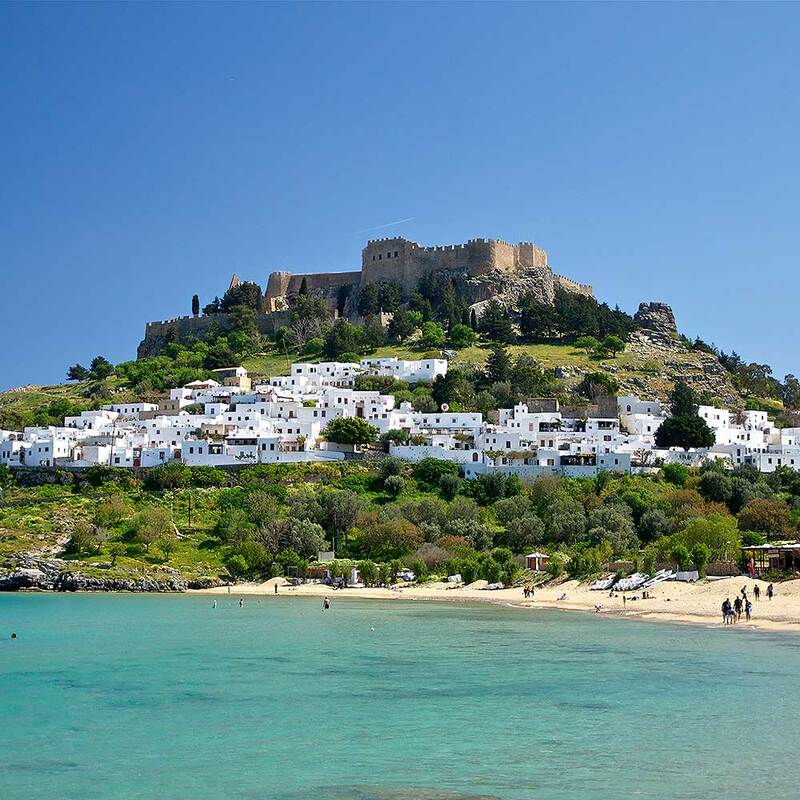 As the visitor discovers, reaching the area, ‘’Lindos seems to enjoy the endless sea’’ indeed. Lindos, like a rock thrown in the sea that stands alone, bathed in waves and is occupied by the most important archaeological site of the island, Acropolis. The valley of butterflies, probably the most famous sample beauty, which certainly worth visiting, is 16 km away from Rodos Blue Resort. One of the rare habitats of Europe, is the summer retreat of the moth ‘’ Panaxia Quadripuctaria’’. Thousands of visitors and researchers come to the valley to enjoy and research this unique phenomenon. Ponds with water lilies, shady paths, wooden bridges, steams and small waterfalls, countless trees create a landscape truly shocking. Near the hotel, just 10 km away are the thermal springs of kalithea. In this place, many Greek and international movies were filmed. The scenes, was ready and had been set by the Italians since 1929. The spa is located on the left side of the beach and is known for sever centuries. Majestic spaces and stairs, impressive Fontana, floral arbours, cobbled streets, the arcade with fountains and small rotunda. 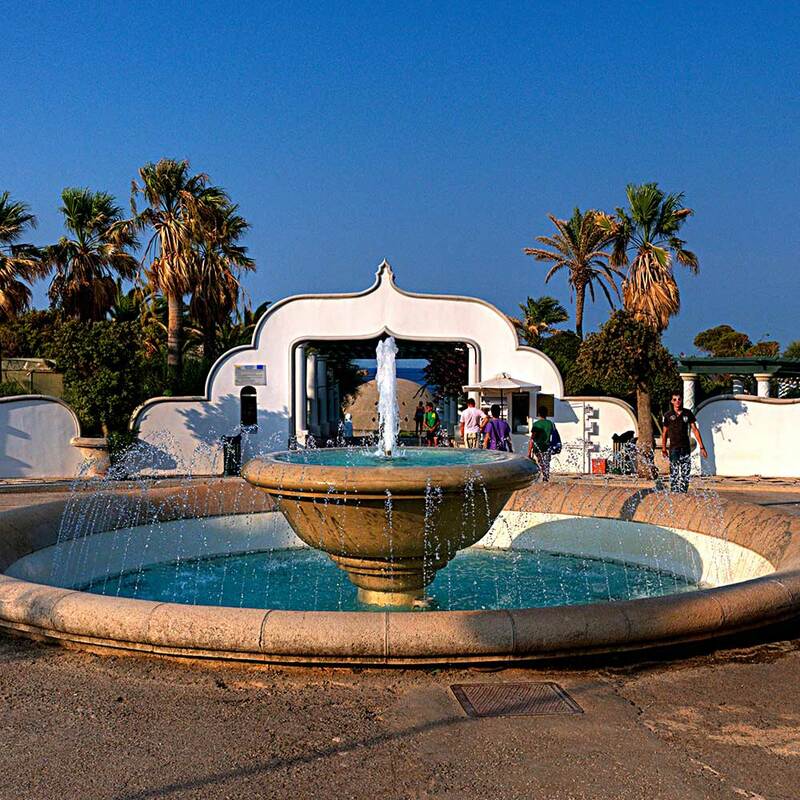 The large rotunda with a 14meter dome and stained glass, the patio, the fountain of love, attract hundreds of people every year who enjoy both the curative properties of water and the luxurious surroundings of facilities. Seven springs. A landscape of incomparable beauty, a paradise on earth just 7 km from the hotel. The name derives from the seven real springs, from which gushes water coming from Loutanis River, and are scattered on a slope. From these seven points, the water that gushes forms a small river which runs through a tunnel to reach a lake. 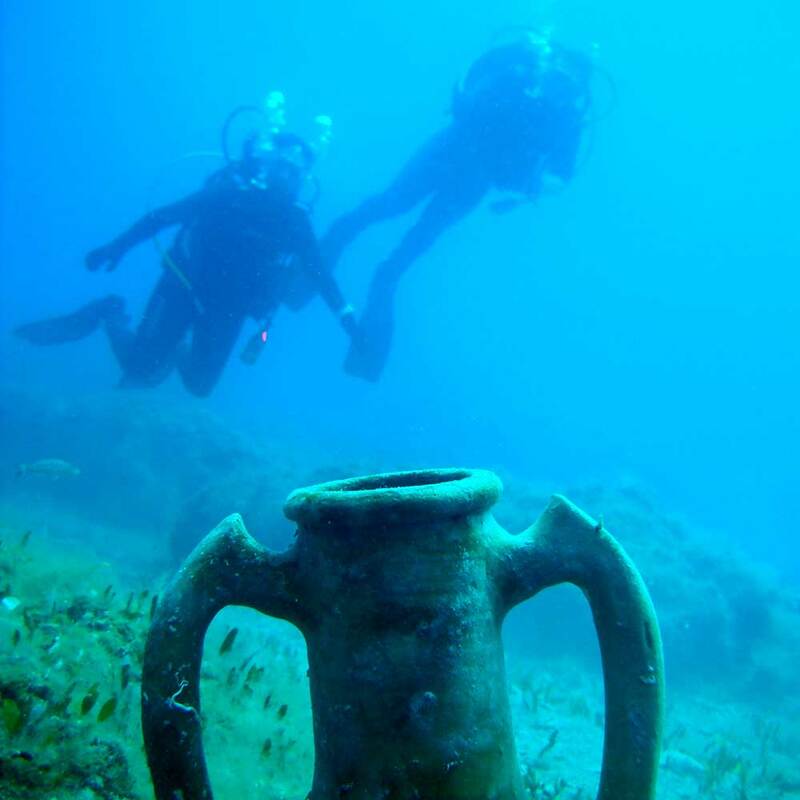 Underwater Rhodes – The real beauty. Rhodes is a historical island that has been a crossroads of civilizations in its long history. Combining unique culture, beautiful beaches and friendly people, Rhodes ranks as a top tourist destination choice for hundreds of thousands of visitors each year. But the beauty of the island does not stop ashore. A wonderful world, a world of incomparable beauty is waiting beneath the sea surface. Over 220 km coastline with different geomorphology, provide to many different underwater ecosystems, full colored, other harmless. Impressive underwater caves and channels recall the volcanic past of the island while hosting divers to the most exciting dives of their lives. The Hotel is surrounded by dreamlike beaches! The hotel is also surrounded by dreamlike beaches. You can enjoy the crystal water of Afandou beach, just 1.2km away from the hotel. 4.5 km away is Anthony Quinn bay, a beach with sand and pebbles, emerald water, which is a real gem and one of the most beautiful beaches on the island. 10 km away is Tsampika beach. It’s a long and wide stretch of fine, golden sand and shallow clean water offering to the guests whatever they could require from a beach on their holidays. Watersports are waiting for those who ask for more activity. A little further away, at 20km, is Agathi beach or Golden sand, which is undoubtedly one of the most beautiful beaches on the east coast of the island. This picturesque beach with crystal water and golden sand is ideal for swimming and sunbathing. Ideal place for those who want shallow, quiet sea. Children will adore it! 10 meter away from the hotel, there is a bus stop, which can take you to all these places.